Wembley has been the scene of many winner-takes-all matches since a stadium first opened there 95 years ago. The 1966 World Cup final between England and West Germany and the 1968 European Cup final between Manchester United and Benfica were two of the biggest games at the old Wembley. The 2010 Champions League final between Manchester United and Barcelona was maybe the biggest in the 11 years since the new Wembley Stadium has stood on the site. On the face of it there is little more than three points on offer at Wembley on Sunday. Tottenham Hotspur continue to call the national stadium home while their new White Hart Lane ground is finished and they will continue to do so until at least March. The North London side welcome Manchester United back to a ground they have come to consider their second home over the years. While it is third plays sixth on the league ladder and the visitors look to claw back the three-point deficit from fourth-place Arsenal and eat into the six-point lead of Chelsea and 10 points of Spurs, there is more at stake in the subtext. In the home dugout is the man who would be king. Mauricio Pochettino is still the odds-on favorite to be Manchester United manager next season. The man who brings the Red Devils to town is the second favorite for the job. After a start that betters his predecessor Jose Mourinho and matches club legend Matt Busby, interim boss Ole Gunnar Solskjaer is quietly making the case to get the job full time. The Norwegian has shown the same understanding he had as a player. It was no coincidence that famed super-sub Solskjaer could affect the game from the bench as well as he could from a place in the starting 11. Nor was it luck that he could be just as deadly playing on the wing as he was in his preferred role as a striker. Spurs and Pochettino present the biggest test of Solksjaer's brief tenure in charge of his former club. There are people who are quick to add the caveat to his winning start that he has only faced Cardiff City, Huddersfield Town, Bournemouth and Newcastle United in the Premier League and Championship strugglers Reading in the FA Cup. Spurs are one of the best teams in the country. Those who argue that the 14 goals scored over those four Premier League games is nothing but normal service being resumed at a club that routinely used to run up the score against teams in the bottom half of the table. The song at Old Trafford refers to United as a team that "often score six, but seldom score 10" and under Ferguson that was true. Solskjaer famously added four goals in just 10 second-half minutes after coming on as a substitute against Nottingham Forest. That game ended 8-1. Solskjaer invited Ferguson to first-team training over the festive period and the former boss gave a rousing speech to the players. The Norwegian, who scored 126 goals in 366 United games over 11 years, will remember the pre-match speech that Ferguson delivered when playing Spurs. "Lads, it's Tottenham" were the Scot's words according to captain Roy Keane's second autobiography The Second Half published in 2014. Keane admitted that those days had changed. "We saw the game against Real Madrid," he said in 2017. "They were very brave, showed a lot of courage, looked like they belong with all the top teams in Europe now, and I think their manager and players deserve great credit - this is a really good Tottenham team now." Spurs and Pochettino have only got better since and Solskjaer will need to motivate his own players in another way. Perhaps the chance to beat a team flying higher than them in the league or a chance to prove that they are better than the critics and the table suggest is motivation enough. Solskjaer certainly seems to have their ear and has got a tune out of the group so far, notably talisman Paul Pogba. This current crop of players are reported to already want the Norwegian to stay on permanently according to the stories coming out of the club while they have been away to warm weather training in Dubai this week. Solskjaer's former teammates are backing him for the full-time role. David May, part of the 1999 treble winning side whose season was capped with Solskjaer's injury-time Champions League winner at the Camp Nou, has lent his support. That is understandable as not only has he got the team playing the way that the fans, May included, want to see but he has also got the results. 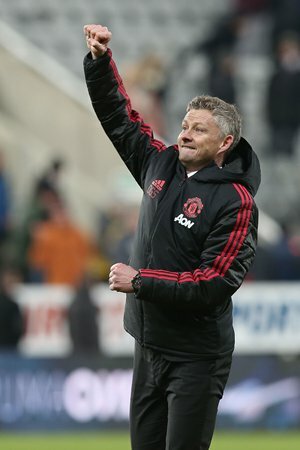 Five wins from five matches Busby but Solskjaer already stands out on his own as the only manager in the history of the English game to win his first five games by two or more goals. If he does guide the side to win at Wembley then he will better Busby's start to management at Manchester United. That will be fitting. It was on this ground that the greatest achievement of the Scot's career played out, lifting the European Cup a decade on from the Munich Air Disaster decimating his Busby Babes. For Solksjaer, victory over Spurs could well be the beginning of his career as Manchester United manager. Solskjaer has described Sunday's game as a "proper test." It is one that if he passes may give him the keys to Old Trafford.